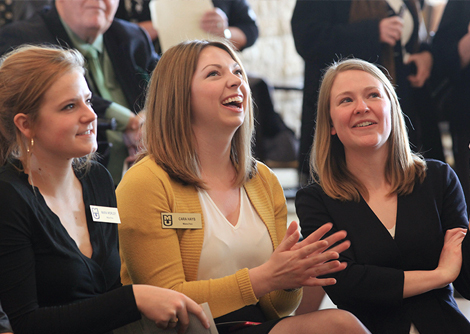 From left, Mara Worley, Cara Hays and Erin Ehlers, members of the leadership group for MizzouThon, watch a video during the announcement of a $1 million pledge to MU Women’s and Children’s Hospital Feb. 12 at the MU Student Center. Photo by Rob Hill. A few weeks ago, Erin Ehlers and a dozen other MizzouThon students spent more than two hours visiting a 9-year-old boy with brittle bone disease. They sat in his house making crafts, chitchatted with him up and kept him at the center of attention. Before they left, he said he had something he wanted to tell them. “I love you guys,” he said. MizzouThon launched its annual 13.1-hour dance marathon to support Women’s and Children’s Hospital in 2008, when they raised $13,500. By 2014, that total grew to $176,291. The money has supported a music therapist, a telehealth program that allows parents to see their hospitalized children over a video feed and a tutor to help hospitalized children keep up with their classwork. On Feb. 12, the students pledged $1 million over the next five years to help fund the recent $3.1 renovation and expansion of the Neonatal Intensive Care Unit, soon to be renamed for MizzouThon. The unit features 20 single-patient rooms, a room where parents can stay overnight with their newborn, and a portable digital X-ray machine and developer. The next dance marathon is March 14. See mizzouthon.org for details. Watch a video of the 2014 dance marathon here. This article first appeared at MIZZOU magazine online.